You can be sure you are doing them correctly and safely! By author and acclaimed Five Tibetan's teacher Carolinda Witt. Contains the same unique step-by-step method developed over years and thousands of students (and forty Instructors) during Carolinda's Five Tibetans workshops, books, DVDs etc. Taught in a clear uncluttered studio setting where you can see and hear exactly what you are meant to be doing. Covers the postures, warm-ups, breathing and core stability and ensures that your alignment - your posture - and your technique is correct from start to finish. 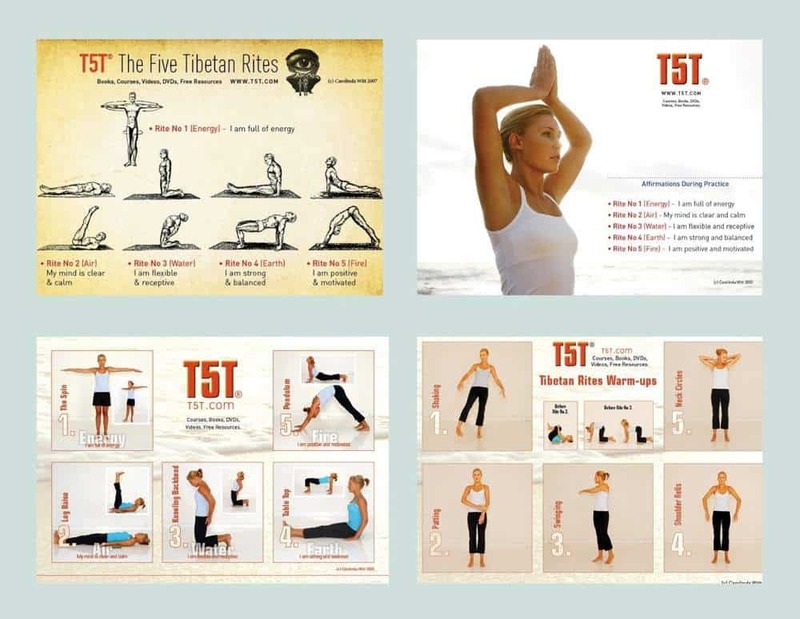 The DVD teaches you how to do the Five Tibetan Rites, and the disc contains two bonus Teaching Guides in PDF format (82 & 59 pages). One contains all the tips, hints, modifications, common problems and solutions to learning the 5 Tibetan Rites, and the other contains the original 1939 story of the discovery of the monks and their anti-ageing secrets. You learn the postures, warm-ups, breathing & core stability in a clear, uncluttered studio setting where you can see & hear exactly what you are meant to be doing. Then you follow along with Richard, one of the T5T Instructors as he leads you through the entire routine. This makes it so easy to remember! The last track will inspire you –for this is how YOU will look! Follow along with some of our T5T Instructors as they perform the full 21 repetitions of each Rite – accompanied by uplifting background music in an attractive riverside setting. Click link for more information on the Five Tibetan Rites and how they work. 123456This product was added to our catalog on Wednesday 23 September, 2009.